As Lockheed Martin prepares to wheel its debut Atlas 5 rocket from the protective confines of the vehicle assembly building to the open-air launch pad on Tuesday morning, the Cape Canaveral weather team has the challenging job of forecasting the conditions the vehicle will face during its day-and-a-half wait before blastoff. Unlike conventional pads, the new Atlas 5 will launch from the United States' first completely "clean pad" that features no mobile service towers to shield rockets from the elements. The concept is designed to provide quicker turnaround between launches. Lockheed Martin expects to compress the amount of time future Atlas 5s spend on the seaside Complex 41 before launch to around 12 to 14 hours, but for this first flight officials opted to transport the rocket much earlier to give plenty of margin in pre-flight schedules to address any problems that crop up. After being rolled out Tuesday morning, the rocket will undergo initial testing, fuel lines will be connected and then kerosene propellant will flow into the Atlas first stage. During Wednesday's countdown, the liquid oxygen and hydrogen will be loaded into the rocket during the final hours before liftoff. "When we are full up and operational, we will be able to do that in less than a day," John Karas, Lockheed Martin's vice president for Atlas 5 development, said of the pre-launch timeline at the pad. "(For the inaugural launch) we are going to split that operation into a couple of days just to make sure we have adequate time to launch the first vehicle on the day we said." The half-hour rollout is scheduled to start at 8:55 a.m. EDT as the Atlas 5, riding atop its mobile launching platform, is moved 1,800 feet from the Vertical Integration Facility building to the pad. Once in position at the pad, the platform will be aligned and locked down. If all goes according to plan, the rocket should spend about 33 hours exposed from the time it departs the assembly building until liftoff at 6:05 p.m. EDT Wednesday. For those 33 hours, the focus will be on the Air Force meteorologists monitoring Florida's dynamic weather and typical summertime afternoon thunderstorms. The point man will be Jim Sardonia, the Atlas launch weather officer. "It's definitely a different challenge now. It is a more challenging weather forecast from what we are normally used to with Atlas 2 and 3," Sardonia said. "Obviously, the forecast for that exposure period is going to be really critical." In comparison, an Atlas 2 or 3 rocket spends only three hours outside of their cocoon-like mobile service towers at Complex 36 before liftoff. "Lockheed Martin has requested a very detailed forecast for that extended period of time the (Atlas 5) launch vehicle is exposed," Sardonia explained. "We will be using every tool we have to make such a detailed forecast for such an extended period of time." Prior to the rollout Tuesday, Sardonia will brief Lockheed Martin on the expected conditions at Complex 41 through launch so officials can decide if it will be safe for the rocket to leave the assembly building. Once the rocket is secured at the pad, it would take a couple hours before the vehicle could be moved back to shelter if nasty weather moves in. Winds: For this first launch, Lockheed Martin has set 32 knots as the limit during the rollout, 35 knots while the rocket is sitting on the pad, 41 knots after the vehicle fueled and between 23 and 30 knots for launch, depending on the direction. Lightning: If there is a lightning strike within 5 nautical miles of the pad, some electrical tests on the rocket may have to be performed, depending on the intensity of the strike and how close it was to the pad. Precipitation: Rainfall amounts will be reported to Lockheed Martin so engineers know how much moisture has gotten on the vehicle. "The main threat would be severe thunderstorms, giving us strong winds, cloud to ground lightning and hail," Sardonia said. "We are hoping for two good weather days, or days when the thunderstorms are to the west of us." To monitor conditions round-the-clock, a Cape launch weather officer will be on duty while the rocket is on the pad, giving Lockheed Martin engineers as much lead time as possible if a storm is brewing. The Delta and Titan weather officers, Joel Tumbiolo and Johnny Weems, will split the evening and overnight shifts. "Say overnight we were watching a thunderstorm develop and it was moving toward the pad. Lockheed Martin does have procedures to pressurize the vehicle so it can withstand more winds," Sardonia said. The weather officials will remain in contact with the crew of technicians in the launch control center watching over rocket systems through the night. "If something unexpected happens, which does happen here, like a thunderstorm pops up off the coast and moves over the pad, there are contingencies where they can harden the vehicle." 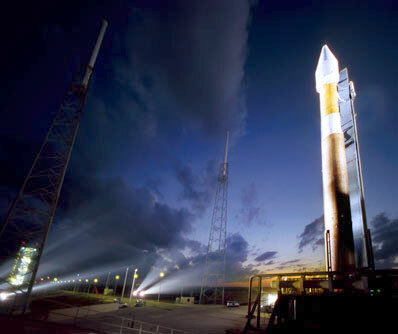 Lockheed Martin says the Atlas 5 can withstand up to 61 knots winds while exposed on the pad. On launch day, Sardonia and his core team of forecasters will start working about 8 to 10 hours before liftoff, tracking conditions and refining their predictions. Once fueling of the rocket with super-cold cryogenics begins inside the final three hours of the countdown, the amount of time needed to roll the rocket off the pad is lengthened. So before the fuels begin flowing, launch officials will receive another weather briefing to understand what conditions will be like later in the evening in case the launch is scrubbed, forcing the rocket to remain on the pad. Sardonia has issued his initial forecasts for Wednesday's launch opportunity. He is calling for a 70 percent chance of acceptable weather. See the latest forecast (issued Monday) and listing of the weather rules here. Earlier this year, the Atlas 5 was rolled out for three countdown dress rehearsals. The first featured a five-day stay on the pad; another saw a thunderstorm pass over the pad, dumping a half-inch of rain and winds up to 26 knots. "The vehicle has weathered the weather that's come through here so far," said Sardonia. The rehearsals were meant to give the launch team practice conducting the countdown and fueling the rocket. But the weather team were also able to iron out their plans and try out the round-the-clock operations. "We've got a good plan," Sardonia said. "Everyone understands what's at stake. With all the launch rehearsals, I think we are in pretty good shape."